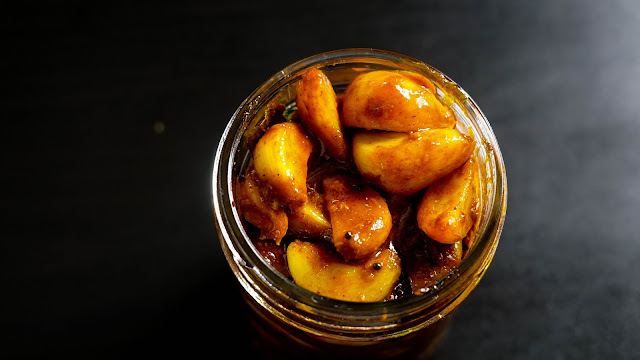 Garlic pickle is a spicy tangy recipe made with garlic and is seasoned with lot of masalas. Any south Indian meal is incomplete without pickle the most famous among them are Mango pickle, lemon pickle and garlic pickle. No matter which restaurant you go in South India the most important dish they serve is this delicious garlic pickle. The best companion of this garlic pickle / Poondu oorugai is with curd rice / thayir sadam. Anything homemade is always good for us. This is my mother-in-law's recipe, She prepares this in large quantity and distribute to all friends and family. My husband is a great fan of this poondu Oorugai but unfortunately we couldn't find any good quality pickle in any stores near my place, the one we get has lot of preservatives in it and it smells vinegary, so i decided to make it myself, its really easy, safe and tastes delicious. I have used lemon juice to overcome the smell of vinegar. Please Click here to watch Garlic Pickle Recipe in Tamil -Madras Samayal. Peel the skin of the Garlic and add it to hot water (no need to boil the water). Immediately after adding the garlic turn off the heat and let is soak for 10 minutes. This process softens the garlic and so it stays soft after pickling. After 10 minutes drain any excess water and pat it dry with a cloth or a paper towel. In a separate bowl combine all the masalas chilli powder, turmeric, cumin, coriander, hing and salt. Keep this aside. Add the blanched garlic pods and mix well with the masalas. Then add lemon juice and jaggery to it and cook it for 2 more minutes. Jaggery is added to balance the sour taste of lemon juice. After 2 minutes turn off the heat and once the pickle is cooked completely transfer it to clean airtight bottle. Make sure the oil floats on the topa a little bit for extended life. Our Garlic pickle is ready in no time. It tastes once it is soaked nicely, So allow it to soak for atleast 2 days before serving. 2. Blanching, I prefer to blanch the garlic because it makes the cloves soft and remains soft after making pickle. Do not use wet hands while serving, always use a clean and dry spoon. We can also use vinegar instead of lemon juice. 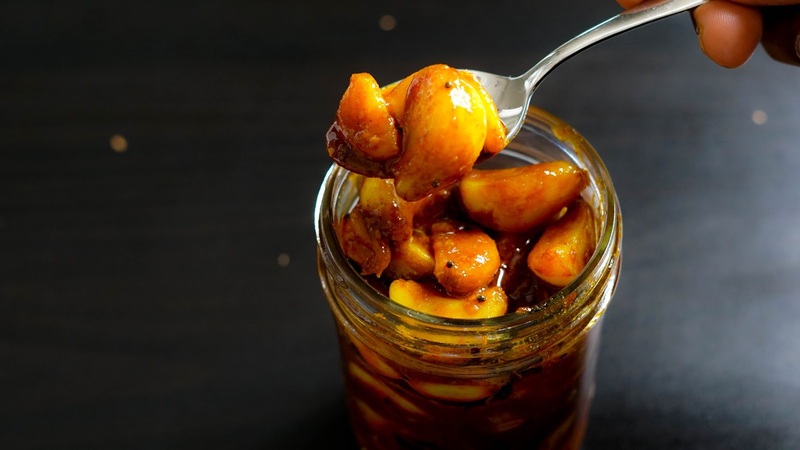 Garlic Pickle is one of the traditional and most famous recipes of South Indian. This is know as Poondu Oorugai in Tamil and is a basic and must recipe in all the households of TamilNadu.This recipe is Spicy, Tangy and tastes delicious.